In total, wind and solar power were responsible for 68% of new European Union (EU) power installations in 2011 and renewable power as a whole was responsible for about 70%. Over 30,000 megawatts (MW) or 30 gigawatts (GW) of the 44,939 MW of new power capacity came from wind and solar—that’s a 37.7% increase over 2010 and sets a new record for the EU. 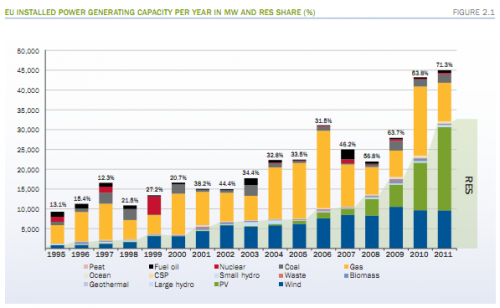 96% of renewable power growth was from wind and solar power, as the pie chart below shows. Solar PV was the leader in new power installations in 2011, accounting for 21 GW (46.7%) of new power capacity, as you can see above, but I haven’t seen much detail on that yet, as all the info I have is from EWEA. 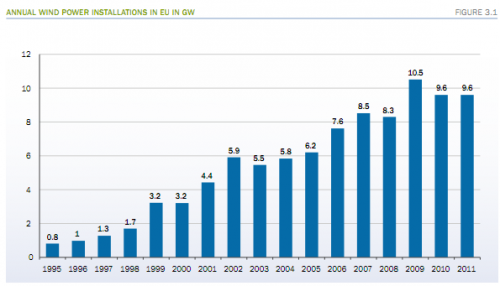 With 9,616 MW of new wind power installed in 2011, the EU now has 94 GW of wind power capacity installed, 11% more than in 2010. 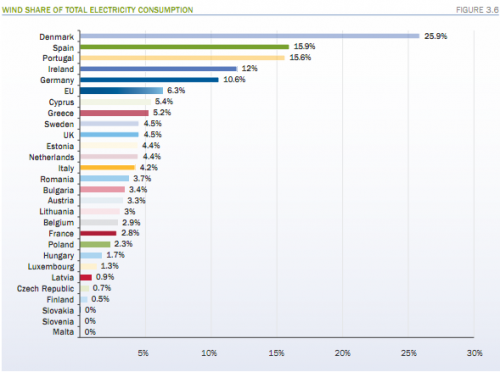 In total, wind power accounted for over one-fifth (21.4%) of new power installations in the EU in 2011. This is very slightly less than the amount of new wind power installed in 2010, 9,648 MW. In total, wind power now accounts for about 10.5% of installed power capacity in the EU, and renewable energy accounts for 31.3%. Its 94,000 MW today is incomprehensibly more than the 814 MW it had installed back in 1995. “Growth in onshore installations in Germany and Sweden, and offshore in the UK – together with continuing strong performance from some emerging onshore markets in Eastern Europe – have more than offset the fall in installations in mature markets such as France and Spain,” EWEA notes. However, 2011 did see more coal installed than decommissioned in 2011, for just the third time since 1998. EWEA notes that this is a clear sign the EU needs to move to a 30% renewable energy by 2020 target (instead of its current 20% target), which a recent study found would cost less than previously predicted, and which would also save the continent billions in the long run. 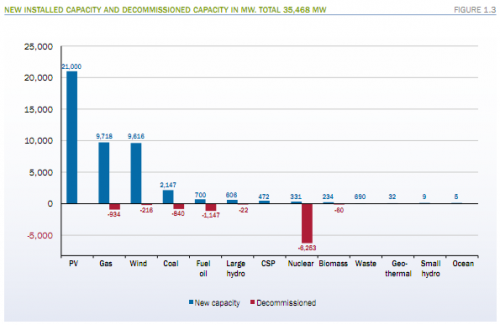 Continuing a long trend, the EU did see more nuclear power decommissioned than installed. As you can see in the chart above, nuclear, especially, was decommissioned to a considerable degree.